All customers, large or small enterprises, firmly established or relatively new, are deploying storage and servers in new and innovative ways; far differently than a just few years ago. Today, most IT environments are highly virtualized and leverage the cloud for cost-optimized data placement. For Midrange customers, our new Dell EMC Cloud Edition software helps drive new flexibility with the cloud and virtualized infrastructures. With even more features for the cloud, and more options to deploy Dell EMC Unity as SDS (Software Defined Storage), converged systems, or as traditional hardware, Dell EMC Unity is the ideal platform for all VMware environments. And with this release, we deliver even more options to deploy efficient, simple and flexible storage. Dell EMC’s Unity platform is the number one Midrange storage platform in the market. We’re listening to you, and based on your feedback, we’ve added numerous new features. Recent innovation includes in-line compression and deduplication, MetroSync, and a wide range of security certifications help our customers deploy Dell EMC Unity over the widest range of workloads possible. Our customers also use Dell EMC Unity on purpose-built hardware, engineered converged infrastructure platforms and software defined storage. In this version, we’ve added a diverse set of cloud-related features that leverage the scale and ease of access of the cloud. 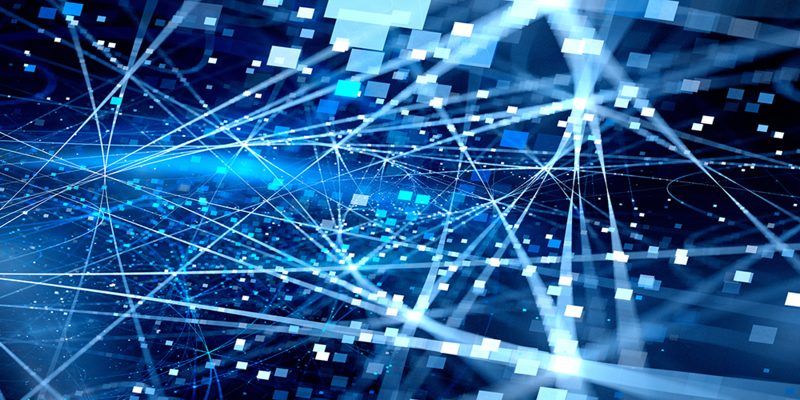 Many customers look to merge the flexibility of a software defined storage with the scalability and flexibility of VMware Cloud, and we’re delighted to now provide those features. Dell EMC Unity platform users now have a virtual data center which expands outside the confines of traditional physical space, and VMware Cloud users now have access to the extensive host of Dell EMC Unity file services, data protection and storage management features. Every type of Dell EMC Unity deployment benefits from more options and more flexibility. 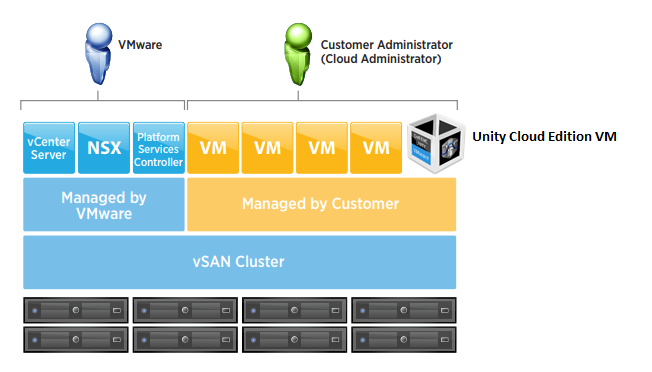 Customers can deploy Dell EMC Unity either on traditional hardware or software with Unity VSA (virtual storage appliance), and the features are identical. 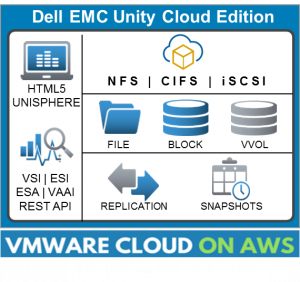 The Dell EMC Unity VSA Cloud Edition provides a unified storage management environment with block, file and VVols support, as well as snapshot, replication and scheduling services. And the intuitive user interface, now based on HTML 5, is identical for every version as well, so all users are immediately at home and productive. And we provide full integration for VMware environments including VSI and ESI plugins, and VAAI support. The Dell EMC Unity VSA Cloud Edition is deployed and certified on a standard VMware ESXi server. With VMware Cloud available on AWS (Amazon Web Services), the cloud-based version of Dell EMC Unity is deployed quickly, ideal for test and development, and as a cost-effective replication destination. Dell EMC Unity VSA Cloud Edition also brings its robust file services to the cloud. Providing more flexibility and portability, the VMware Hybrid Cloud Extension enables large-scale data migrations between cloud environments and the users’ on-premise Dell EMC Unity hardware and virtual environments. Dell EMC Unity customers seeking cloud deployments for their business now have a path without learning anything new – it couldn’t be easier. The same Dell EMC Unity operating environment and intuitive user interface are now available in all environments, in the cloud or as traditional hardware. For those adopting the cloud today, or those considering multi-cloud in the future, Dell EMC Unity is ready on your timetable, so you get to pick the timing and the product version that best meets your needs. According to IDC, the total spending on IT infrastructure for the cloud is $52.3B and growing at 10.9% annually. Whenever you’re ready to jump in, we’re ready too. With the new Dell EMC Unity VSA Cloud Edition, both first-time cloud users and more established multi-cloud IT shops will benefit from the feature-rich capabilities in Dell EMC Unity, now optimized and packaged for the cloud. Let us know what you think, we’re always interested in your constructive feedback.